Block Name: "Hole in the Barn Door"
Millbrook resident and quilter, Jeanne Moran, has been part of the Cavan Monaghan Quilt Trail initiative from the first meeting. She was also the first to paint and install a barn quilt panel here at her home. The quilt pattern is the very traditional Hole in the Barn Door. The Owl is an appliqué pattern; a pattern is stitched onto a quilt using a different stitch from the usual quilt stitch. 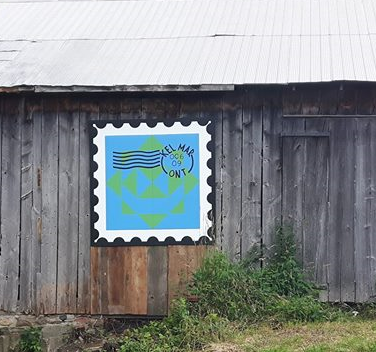 Jeanne chose this classic design to adorn the barn on her property where she does all her quilting. 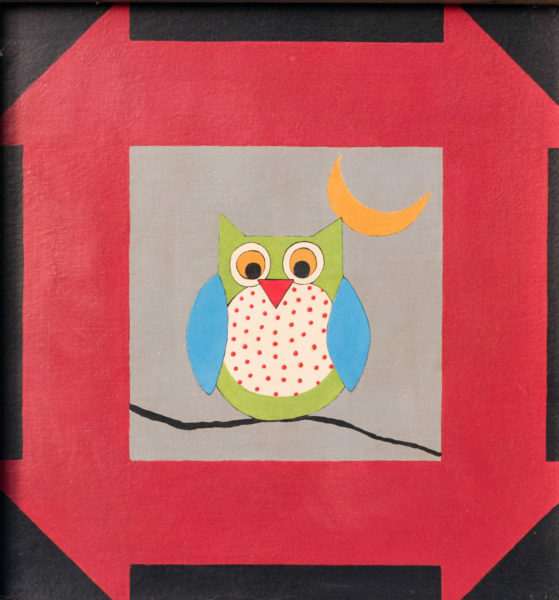 She created the image of the owl on a branch using the visual perspective of looking outside through the “hole in the barn door” and seeing the trees with an owl sitting there. The colours were chosen to match the grey of the barn and the red of the door; while the quilter in Jeanne conjured up the imaginative colours of the owl. Jeanne and her husband are privileged to live in what is believed to be the oldest house in Millbrook, built around 1835. The original barn was erected around 1837, although the current structure is a replica. There is a historical mystery with this house as curiously no map or plan of the village ever showed a building in existence at this location. This house is a lovely example of an Ontario Regency cottage. The exterior walls are wood covered with embossed panels of tin. The porch is decorated with intricate gingerbread, posts and railings. The original front door was actually on the Baxter Creek side as people came and went using the creek before roads were built. You can glimpse the “front” of the house from County Road #10 just down the hill from Bank Street North. The house was purchased a couple of years after its construction by a member of the influential Sowden family, John V. Sowden. On the southeast corner of Bank Street North and County Road #10 a flax mill and a distillery were situated, owned by two of the Sowden brothers. John V. Sowden was the first born of 16 children. But it was his 8th sibling, William Henry, who was to become especially famous; known locally as “Squire”. He served in many public offices such as Reeve and Justice of the Peace, and became very prosperous by his many land transactions, including a large property where he created the long-gone “mansion grounds.” The late 1870s saw a period of depression for farming in Ontario. Always the savvy business man, Squire Sowden moved his family and a sizeable portion of the population of Millbrook west to Manitoba, where they settled in Souris. A striking addition to the Home Hardware building on King Street, the “Carpenter’s Home” 8’x8’ block uses vibrant red and yellow with white, bordered by black, to echo the store’s sign on the front of the building. This unique block is framed by the traditional Carpenter’s Star quilt block design. The stylized maple leaf identifies the company as wholly Canadian, and the simple house outline reflects Home Hardware’s business. David Britton, manager of Millbrook Home Hardware, has been an enthusiastic supporter of the Cavan Monaghan Barn Quilt Trail from the beginning, and welcomed the opportunity to be the first business in the village of Millbrook to host a block. The modern, single storey building where the block is mounted was built in 1978 on the site of the western portion of the impressive, High Victorian style business block on the south side of King Street. The original building was destroyed by fire in May 1960. At one time, a small independent hardware store was housed right next door to where Home Hardware is today, with another just across the street; a sure sign of the enduring value of this service in the community. Block designed by Kate DeKlerk, Debra Jackson, Bonnie McQuarrie, with David Britton. Block painted by Maya deMaria, Betty Hobson, David Hobson. 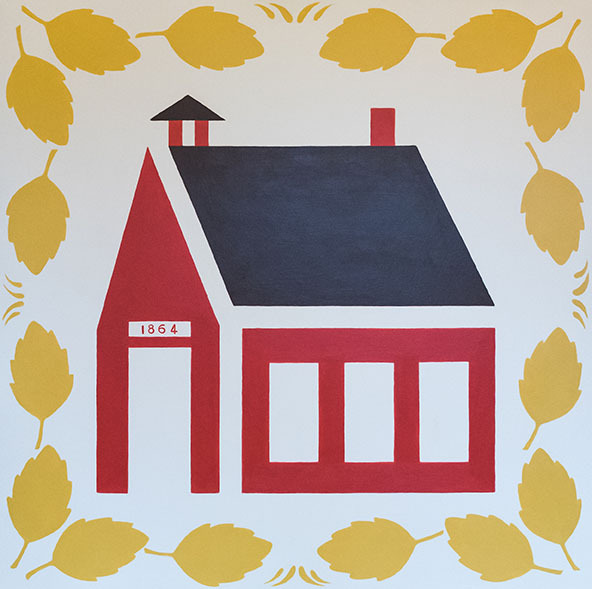 The “Beechwood Schoolhouse” quilt block is based on a traditional Schoolhouse design, modified to mirror Beechwood’s features, and is framed by a motif of beech leaves to reflect the name. Adrian and Cathy Olley bought this property in 2013 and continue to cherish the one room schoolhouse that was so well preserved by its previous owners, Murray and Bronwen Hofstetter. Beechwood School was constructed in 1864, using locally manufactured bricks from the Cavan brickyard, which were also used in St. John’s Anglican Church in Ida. The school replaced Sharpe’s School (1834), once located just to the south. At least nine of Beechwood’s teachers were from the Sharpe family; others were from the Stewart, Lough and McCamus families. A well to supply water to the school was dug in 1937 and an outdoor pump installed. A wood stove supplied heat in the winter months; it also served as an ideal surface for students to warm up lunch buckets of soup and toast sandwiches! Beechwood School (S.S.#4, Cavan) was closed in 1963 when North Cavan School opened, and in 1965 the property was sold to the Hofstetters, who used the schoolhouse as an artist’s studio, preserving the blackboards and some of the other furnishings. It now serves as Cathy Olley’s quilting studio. In 2016, a school reunion attracted close to 40 former students back to the site, with many a tale to tell. Block designed by Cathy and Adrian Olley, Kate DeKlerck, Debra Jackson and Bonnie McQuarrie. Block painted by Jeanne Moran. 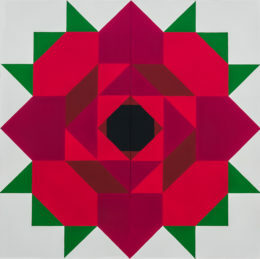 This unique quilt block design conceived by H.A.R.T. Yoga studio owner Wendy Gerolamy. This pose, described as a heart-opener, tones and lengthens, stimulates and expands, developing balance and concentration. 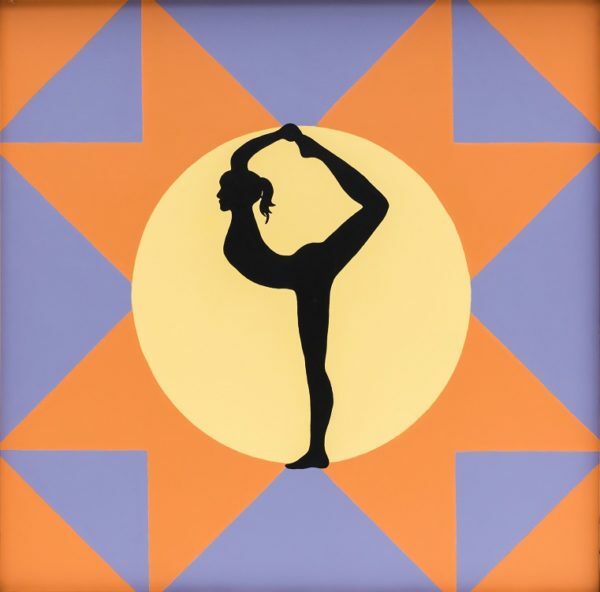 These are among the positive benefits that Wendy, a registered Yoga teacher, passes on to her students at her peace-filled and comfortable studio nestled among mature trees on the property she and her husband Steve own northwest of Millbrook. When Wendy began practicing yoga 18 years ago, she knew it was something she would follow for the rest of her life. “It’s a great way to connect to yourself,” she states, “ and to nourish the mind, body and soul.” Guiding every student to achieve a sense of calm and well-being while developing a greater understanding and appreciation of self are the goals of a true Yoga teacher, Wendy feels, and she encourages growth and grounding through the practice of flow movement and focused breathing. The sugaring process usually begins early in March and can extend well into April depending on Mother Nature. Cool nights below zero, followed by days with above zero temperatures, are required to allow the sap to expand up from the roots and into the trunk and branches. The trees are tapped, spiles are placed in the holes and metal buckets are hung on the spiles. Then the wait for the dripping begins! It’s very rewarding going out to collect the sap and finding the buckets full! The sap is boiled over an outdoor fire, then filtered and finished in the house. Theirs is only have a small operation (60-100 trees), but they are able to supply friends and family with some of the best syrup around! Their syrup has travelled across Canada, and overseas to England, Scotland, Sweden, Germany, Japan and Australia. Block designed by: Pat Barr and Debra Jackson. Block painted by: Jeanne Moran. 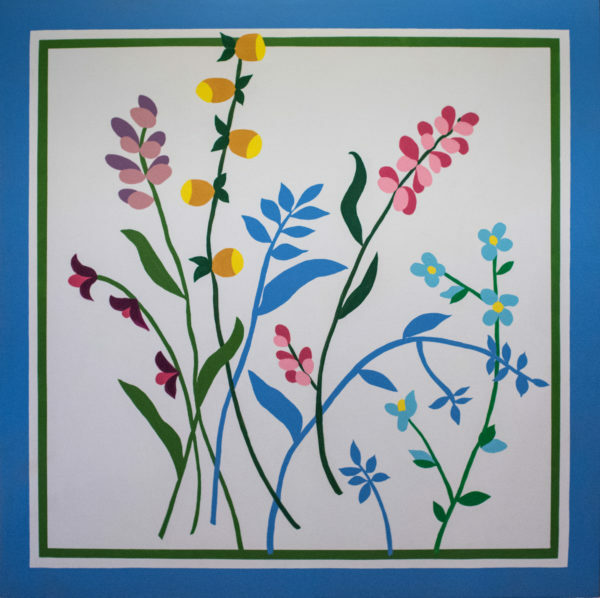 A replica of the quilt Liz Avery’s mother made for her in 1985, this unique appliqué quilt block bursting with lupins, foxgloves, fuchias and forget-me-nots recalls for Liz her grandfather’s mountaintop garden, aptly named Peak, located in Springville, New York State. Liz remembers her mother’s father teaching her as a young child how to wear foxgloves on her fingers and make hollyhock dolls. Creativity runs in the family: Liz’s mother, Kashi Carter, was well known, mid 20th century, for her handcrafted sets of historical dolls that became valuable collectibles. A former member of the Oakville Stitchery Guild, Liz herself is a skilled and ingenious needleworker, and always has at least half a dozen projects underway when she isn’t out in her own beautiful garden or up to something creative in the village and beyond. Liz and her husband Hal moved to this Second Empire home with its characteristic cedar shake Mansard roof in 2005. The house was built by carriage maker Alexander Ferguson in 1863. The property extends down to a meandering stream where, a century ago, Gordon McIvor’s oatmeal mill stood just to the east. Liz has created a small pond that features water iris, lily pads and wild phlox. A series of colourful flower beds cover the slope from house to pond and, in front, memories of Peak Garden are reflected in the hollyhocks and lupins. This quilt block is both attractive and intriguing because it presents itself not only as a quilt block but also a postage stamp. Nancy and Ted Hodgkinson, the present owners of this property, wanted to honour and celebrate the history of their house, which was originally used as a cottage industry for making shoes and later became a rural post office. The traditional quilt pattern of “One, Two, Buckle my Shoe” alludes to the long ago manufacture of shoes; the scalloped edging, post mark and cancellation recall the days of the rural post office; and, the colours of green and blue are taken directly from one of the stamps used during the period the post office was in operation. This property on Tapley 1/4 Line was a crown grant of 100 acres given to John Staples in 1831. That same year, John Staples sold this land to his widowed sister, Sarah Coe. The existing house was built some time later. Essential for a widow with five children, Sarah Coe supplemented her income. And she did this by making shoes. During a recent renovation one of her shoe lasts was discovered behind a wall. A last is a wooden form in the shape of a human foot used in the manufacture and repair of shoes. The barn on which the quilt block is installed is also a very old building but sadly no documents have come to light showing the date of construction. Jumping forward in time to 1909, the kitchen of this house became a rural post office. The home owners and operators of the post office during that time were the Matchetts. The name you see on the quilt block’s post mark, “Kelmar”, is a combination of the names of three local families: Kelly, Matchett and Richardson. This rural post office was short-lived, however, and in 1913 it closed as mail delivery had begun for the rural population. Admiring this quilt block inspires one to reflect on the past and the people dwelling in or visiting this place-- making shoes, coming to have shoes made or repaired, handling mail and receiving or sending parcels and letters. Mounted next to the entrance to the Royal Canadian Legion, Branch 402, in Millbrook, the “Remembrance Poppy” 8’x8’ barn quilt block represents the readily recognized symbol that honours veterans and commemorates those who have given their lives in the service of their country. Red poppies have been associated with conflict since the Napoleonic Wars of the early 1800s, when a writer of that time first noted how poppies flourished over the graves of soldiers. During World War I, Lieutenant-Colonel John McCrae, a Canadian Medical Officer, wrote “In Flanders Fields” which inspired the wearing of a poppy as a sign of remembrance. Among the many services Branch 402 provides for the community throughout the year is the annual Remembrance Day Parade and Commemorative Service held close by at the Cenotaph. Branch 402 received their charter in 1946 as soldiers returned from service in World War II, and in 1948, Branch 402 Ladies’ Auxiliary was formed. In its early years, the Branch used an old freight shed near Millbrook’s railway station as a meeting place, and later built a cement block structure on Distillery Street. In 1965, the government demobilized the Cavan and Millbrook militia unit and the Legion executive, with the support of the village Council, obtained the Armouries for Branch 402. The wall on which the “Remembrance Poppy” barn quilt block is mounted is part of an addition built onto the original Armouries building, constructed in 1913. A ramp from the street up to the entrance of the Armouries enabled vehicles to come and go, and there was a rifle range in the basement. 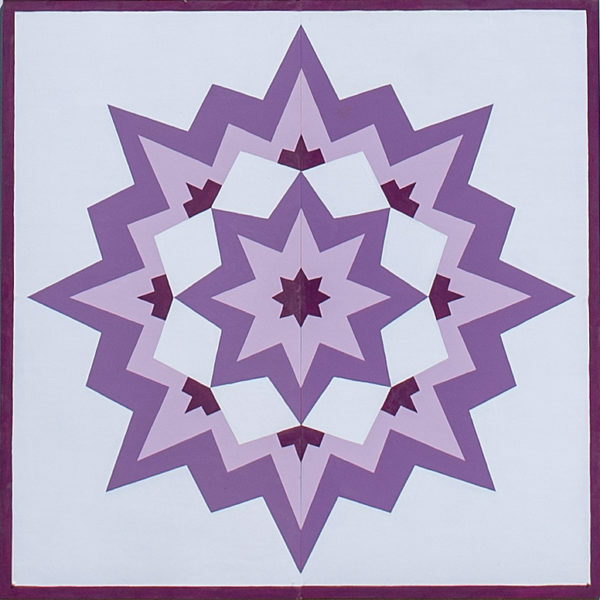 This traditional quilt block in white and shades of purple is reproduced from a real quilt. While attending an auction in Lindsay, Carolyn and Dave saw a clothesline hung with beautiful quilts up for auction. A white and purple Broken Star caught their eye, not only for the colour and pattern but also for the skill of execution. They were lucky enough to secure it and it now adorns a king-size bed in their home. It is one of those odd coincidences that their quilt was made by Mennonites and her father’s family, the Vansickles, are originally Pennsylvania Dutch. Purple is “her” colour and the star patterns are her favourite. Carolyn has quilted from childhood, starting with her mother and her mother’s sisters. She still treasures the patterns made out of cardboard they used for quilting when she was a child. The Brackenridges’ 60 acre farm, Squirrel Creek Farm, was purchased by Dave’s father, Ernest, in the early 1960s. The original land grant of 100 acres was to James Fair, who subsequently sold it to John Challice. Dave and Carolyn moved from Petrolia in south-west Ontario to take over the farm in 1970. The shed on which the quilt block hangs was built in 1979 and was intended to store farm machinery. It was never used for that purpose, rather it became part of their feed supply business. Since giving up the feed supply business, it is used as a retail store--in the spring selling equipment and supplies for producing maple syrup, and from September to December they operate “Country Charm at the Barn” which offers a wide variety of home decor and gifts. Aside from farming and retail, the Brackenridges occupy their time with two other businesses: a sugar bush that produces around 175 litres of maple syrup each spring and a grain elevator that stores and transports the grain from farms in the area. Their son, Steve, is a farmer too. He lives south of them on his own farm at 1445 Carmel Line where you will see another barn quilt: Horse Over the Barn Door. 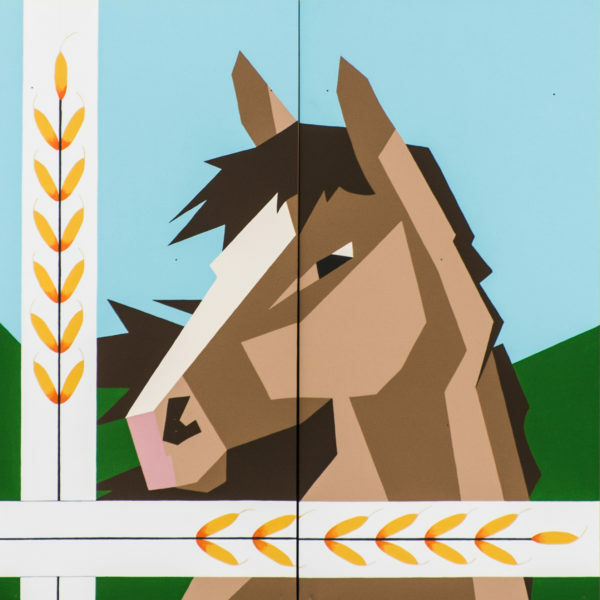 The “Horse over the Barn Door” is an original design by Debra Jackson in the style of a foundation paper pieced block design. The primary motif is a horse that reminds property owner Steve Brackenridge of his grandfather Ernest’s passion for Belgians, Clydesdales and Percherons. This property has long been in the Brackenridge family, and Steven recalls his father’s tales of being sent to bring in the always crafty and elusive horses from the pasture and nearby woods. Bordering the subject are stalks of wheat that record the long history of growing grain on what the Brackenridge family maintains is some of the best farmland in the township. Ernest, Steve says, was always proud of the wheat he grew, and rightly so. The Belgian horses that Ernest Brackenridge owned were used in the sugar bush on the farm right up until 1988. Nowadays, while maple syrup is still produced on the farm, Steve concedes that the horses he owns are pets. However, wheat is still a vital part of the crop rotation on what the family proudly claims is probably “the best dirt” around; well drained and sandy. The Brackenridge family, originally from Ayeshire in Scotland, settled first in the Keene area, then Westwood and Wallace Point in South Monaghan before purchasing a 300 acre farm west of Bailieboro in 1918 on what is now the Carmel Line. Steve Brackenridge bought his grandfather’s farm from his own dad, David, in 2009. He also owns and operates Squirrel Creek Farm and serves as Provincial Director of the Ontario Federation of Agriculture, representing Durham, Peterborough and Kawartha Lakes-Haliburton. Block designed by Debra Jackson, Bonnie McQuarrie, Kate DeKlerck. Block painted by Jeanne Moran, Maya deMaria. This quilt block project was created by the students in Grade 1 and Grade 4-5 at North Cavan Public School in the spring of 2017. 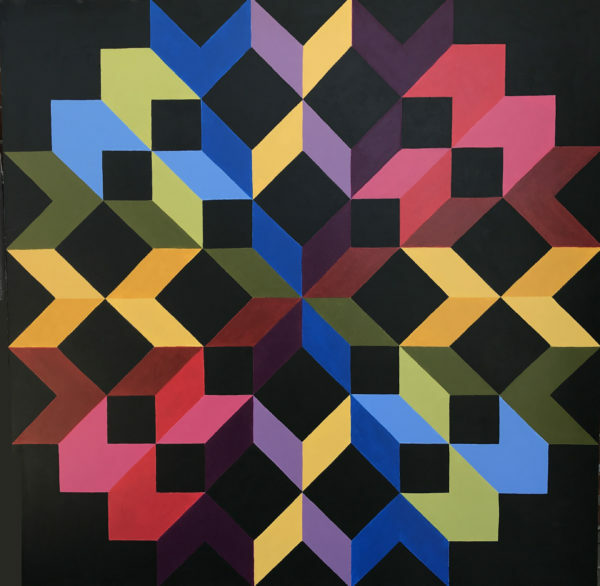 The 20 individual blocks are mounted on five display panels made up of four blocks each, using traditional quilt patterns chosen by the participants. Wild Goose Chase and Bear’s Paw. Several members of the Millbrook Needlers Quilt Guild directed and oversaw the project, meeting initially with the students in late winter to introduce them to the tradition of quilts and quilting. CMBQT Board member Elaine Young, a member of the guild, researched the origins of 20 traditional quilt blocks linked to agricultural themes, and brought examples of all of the blocks to the students so that they coulddiscuss and evaluate them. Then the students from both Grade 1 and Grade 4-5 cast ballots to select the four patterns they used. Beginning with paper and coloured pencils and crayons, they all learned about the importance of colour contrast. Then the patterns were penciled onto the primed boards and Grade 4 and 5 students took the lead on taping. In groups of two or three, the older students worked closely with their younger partners in the painting process, with guild members always in attendance to advise and encourage. By early June the blocks were finished and the students, their accommodating teachers, supportive principal and the guild members celebrated with a popsicle party outside, and photos of each group of students with their respective blocks. North Cavan Public School, 2017. 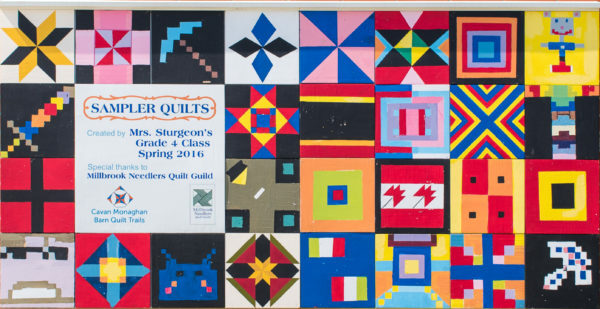 In the spring of 2016, Mrs. Sturgeon’s Grade 4 class, made up of 28 students ages 9-10, enthusiastically embraced the Barn Quilt Trail project and worked together to produce “Sampler Quilts” which is displayed on the south-facing wall of the Millbrook South Cavan Public School. Sampler quilts, popular since the mid-1800s, are comprised of different block patterns that are generally non-repeating, providing an ideal format for this class project. Members of the Millbrook Needlers Quilt Guild, led by CMBQT’s Elaine Young, worked with the students, encouraging them to use skills relating to mathematics, history, literature, art and design. Each student designed and painted their own square, and wrote a short account of the inspiration for their design and the process of creating their own unique block. This project began with Elaine and her Quilt Guild volunteers meeting with the class to show them some examples of fabric quilts, and reading a story, Oma’s Quilt by Paulette Bourgeois, that talks about how a quilt can hold treasured memories. The students then had an opportunity to look through books, magazines and on-line to appreciate the variety of quilt block designs. Then they put their imaginations to work. Challenged to come up with their own designs, some chose video game themes and characters; others found inspiration in what they saw around them or in a memory of a special moment. Among the sampler blocks can be found a ferris wheel, a butterfly, geometric shapes, flags and emblems, and much more. Each student used graph paper to plan out their design and then transferred their pattern to their block. According to their written accounts, choosing paint colours was both satisfying and personally meaningful, and the painting process itself, requiring the use of both tape and patience, was a valuable and positive learning experience. The students took pride in having their finished blocks displayed at the Millbrook Fair. Block designed and painted by Mrs. Sturgeon’s Grade 4 students, Millbrook South Cavan Public School, 2016. 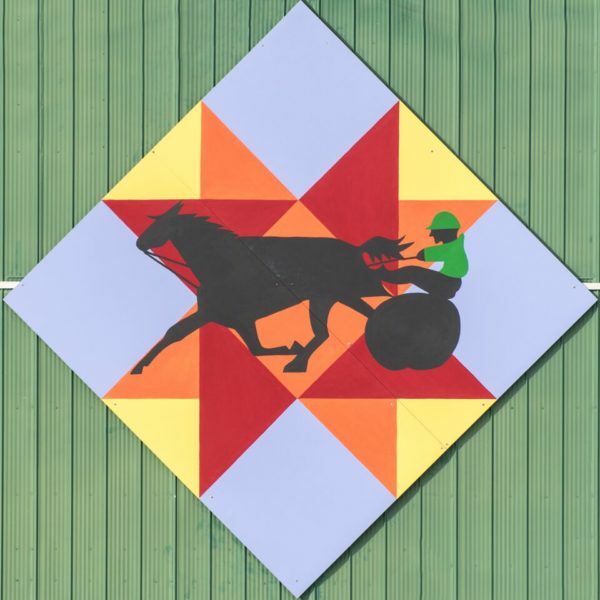 The Millbrook Agricultural Society’s 8’x8’ quilt block is mounted on the exhibit building at the Fairgrounds in Millbrook. 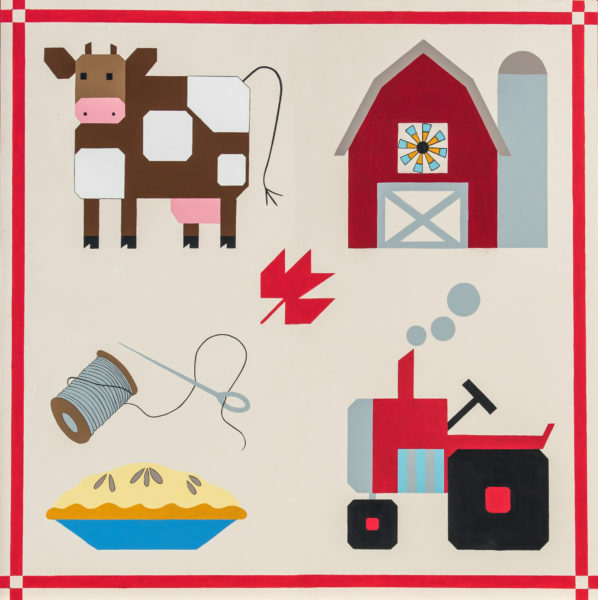 The appliqué-style quilt block highlights four key elements of rural living that are featured at the Society’s annual Agricultural Fair held the second weekend of June. The block design illustrates the importance of the care and breeding of livestock; active farm properties; agricultural production; and home crafts that include both the more traditional arts of baking and needlework along with photography, plants, preserves, floral arrangements and crafts. 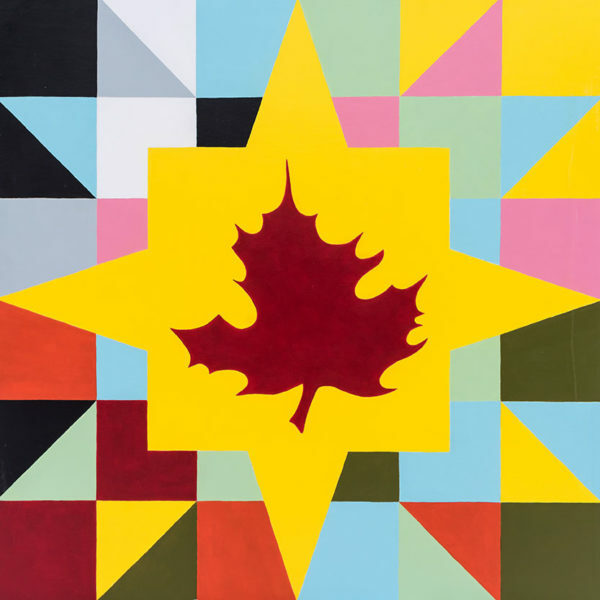 In the centre of the block is a maple leaf motif, recognizing allegiance to Canada, and on the barn is a quilt block featuring the traditional Ferris Wheel quilt pattern as a reminder of the fun to be had at the Fair. The Millbrook Agricultural Fair has a long and distinguished history, with records showing that local fairs were held as far back as the 1830s. However, based on a 1949 grant submission for recognition as a centenarian fair, the Agricultural Society counts 1849 as the official date of the first fair. Reorganization of the Agricultural Society in 1942 resulted in the switch from a fall fair to a spring date, and since that time, the Fair has taken place in June. Drawing together all ages from both rural and urban communities to provide an educational and entertaining weekend is the objective of the Agricultural Society. 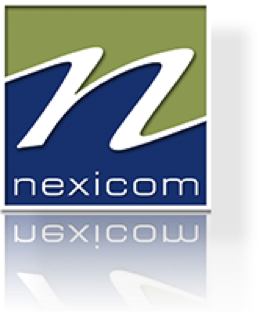 They accomplish this by offering a wide range of events, competitions, activities and displays that focus on the importance of agriculture while never forgetting to have fun. The official logo, designed by Karen Shaughnessy and adopted in 1980, features a pig to symbolize the agricultural aspect of the Fair and a clown to represent the entertainment. This arresting block is based on the traditional pattern, Carpenter’s Star. But along with the star, the border was doubled and the colours were manipulated to create a 3 dimensional effect. Look closely at the rectangles created by this 3 dimensionality. Think “bricks”, as in the bricks that have made this solid, century home (see more on bricks below). The designers chose the colours to compliment and enhance the brick wall. Thorneview is the name of the house that boasts this attractive quilt block. The owners of the house and quilt block, Francisca and Bruce Gazley, chose the name Thorneview to celebrate and honour two important things: first, the Thorne Family, a local family who both made bricks and built houses using this brick; and as for the “view”, the owners relish the spectacular view looking south-east from the front of their house down over Medd’s Mountain. The Thorn or Thorne Family were one of this area’s founding families. Arriving in 1815 from Devon, England, father and 17 year old son (both named John) brought with them the important skill of bricklaying. However, in the early decades of the 1800s the rural areas of Canada lacked many basic industries, including the manufacture of bricks. And so when Millbrook began to take shape and when brick houses and businesses were required, the Thorne family was ready with the expertise and labour to manufacture bricks. Luckily Millbrook and area had large deposits of clay that made admirable bricks. The local brickyard was located at 62 King Street East; just down the hill and around the corner from the Gazley’s home. The prominent hill in Millbrook which glories in the name, Medd’s Mountain, is named after the first European settler who owned the land. Today this land hosts a park and a forested area with trails. Throughout the history of Millbrook, Medd’s Mountain has been a place to gather and celebrate. When he visited Millbrook, Canada’s first Prime Minister John A. MacDonald, is known to have enjoyed a drink or three with friends on Medd’s Mountain. 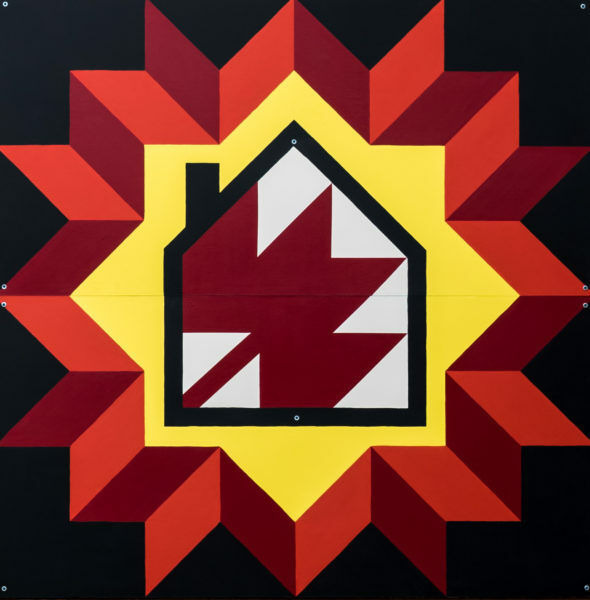 On the southwest corner of County Road 10 and Sharpe Line, the 2’x2’ barn quilt block featuring the traditional Sunbonnet Sue quilt pattern is a reminder of the building’s interesting history. Alexander Baptie and his wife Helen arrived in Ida from Scotland in or about 1840, and opened a general store here soon afterwards. Alexander’s untimely death in 1850 meant that Helen Baptie was hard pressed to support herself, four sons and one daughter on the income from the store, and so supplemented her earnings by designing, making and selling bonnets in a section of the store she called “the bonnet shop”. 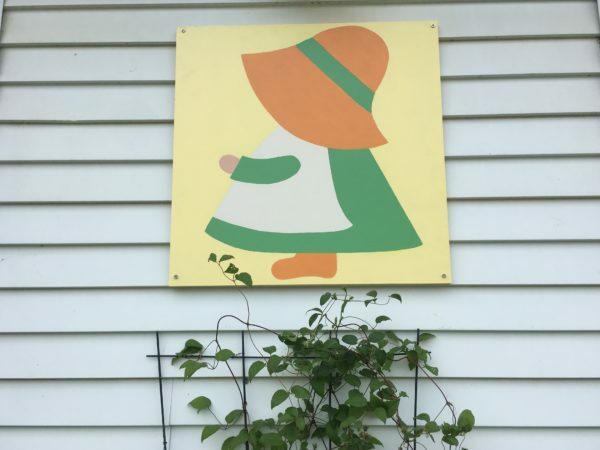 The current owner of the property, Kathy Abnett, chose the Sunbonnet Sue design as a tribute to Helen Baptie’s creative enterprise. Helen Baptie’s eldest son stood by his mother in the operation of the store and was named postmaster in 1868, a position that stayed with the store for close to 100 years. Helen’s daughter, also called Helen, married Willliam Lough in 1879, and they took over the operation of the store from Helen, after which their son Roy, with his wife Laura, ran the business and served as postmaster until 1954. In the early days, supplies for the store came from Cavan Station, and included everything that the community might need: rubber boots, hardware, overalls, groceries, drugs, thread, soap, bluing, coal oil and more. Once rural mail delivery began in 1913, Roy would often deliver groceries along with the mail he brought around. He also grafted wild apple trees on his route – look for luscious fruit along the fences in the fall. Hilbert and Muriel Allen bought the store from the Loughs in 1954 and ran the business until their retirement in 1979. In the mid 1980s, new owners Sterling and Barbara Willows built an addition and opened a craft shop and tea room that they named The Bonnet Factory. Sadly, the business didn’t thrive, so they remodeled the store into a private home, where Kathy Abnett lives today, proud to honour the history her home represents. Please Respect Private Property. Most quilt blocks are installed on private property and should be viewed from the road. Please do not trespass. In some cases - only where clearly indicated - the barn quilt may be located on a business and the property may be open to the public.